German ministers and scientists finally abandon the global warming hype and preach ‘climate disruption’ claims as last hope for new raft of taxes. Germany’s Federal Ministry of Education and Research (FMER) has signalled a decisive switch in global warming policy. In it’s latest official press release titled, ‘Cold Winter in Europe Does Not Question Climate Change’release (February 22, 2011) Germany’s pro-green government finally fell into line with the U.S. and British environmental campaigners; global warming is dead and ‘climate disruption’ lives in the most populous (82 million inhabitants) nation of the European Union (EU). Germany has long been a major force in the climate wars and Angela Merkel and her Christian Democratic Union (CDU) government, in particular, have shaped wider EU climate policy. With the realization that scares over catastrophic global warming have fooled no one Merkel is pinning her green taxation hopes on the ‘climate disruption’ banner. The FMER, however, was not quite letting go of the global warming narrative as it reared its ugly head more than once in the press announcement. But in a bait and switch move that U.S. President, Barack Obama would have been proud of the Germans obfuscated their outmoded global warming hype amongst the increasing and contradictory body of evidence showing cooling. Taking lessons from the Whitehouse the German version of the global warming spin machine has now switched over to a ‘climate disruption’ narrative instead. In it’s statement, despite conceding that “December in Germany was four degrees colder than average” FMER fiendishly insist that such cold is, in fact, proof of ‘climate disruption’ – a belated tacit admission that global warming had, in fact, stopped in 1998. Er, no, FMER, that’s not the best way to do it! Aren’t climatologists constantly telling us that weather events are not climate? Then, sticking strictly to the doomsaying warmist line came Jochem Marotzke, director of the Max-Planck-Institute for Meteorology and head of the German climate consortium. Marotzke, an otherwise nice chap to his friends, warned us that “our personal sensations are useless” and that “in spite of the cold Northern European winter, 2010, on a global scale, was one of the three warmest years on record.” Pull the other one, Jochem! Propagandists like Jochem will have a rather hard time selling that brand of BS in many southern hemispheric nations such as Australia. The Aussies, for instance, had a string of unusually cold weather records in 2010. Alice Springs endured it’s coldest day since August 1966, Sydney had its coldest June morning for 60 years and Melbourne it’s longest cold snap in 14 years. 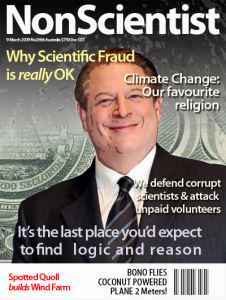 But here we need to realize where the secret weapon for the global warming fraudsters is hidden – it’s in the so-called ‘homogenized’ data; those computer-crunched numbers (not real temperatures) cooked up by clandestine government organizations such as the U.S. National Oceanic and Atmospheric Administration (NOAA) and Britain’s Climatic Research Unit (CRU) who both decline to show their calculations to independent auditors. What is not being conscientiously reported is that NOAA admitted that in 2010 sea surface temperatures actually decreased across the equatorial Pacific Ocean with the end of El Niño; a cooling ocean is an excellent signal of future atmospheric temperature trends being that the heat capacity of water is 1000x greater than the heat capacity of the atmosphere and our oceans cover 71 per cent of the planet. So if the oceans are getting cooler they, in turn, will likely begin to cool the atmosphere. Some measure of sanity is briefly restored in the later part of the statement whereby Annette Schavan, federal minister of research stresses, “The connections between weather and climate are complex and regionally different. We therefore have to further deepen our understanding of system earth to be able to successfully confront the consequences of climate change.” At last, we got a frank admission those climatologists have a lot more to learn. Schavan then goes on to assert that climate is subject to rather large natural fluctuations and can change much more on a monthly or yearly basis and that “climate change can have large regional differences.” The problem she and her doomsayers now have is trying to unpick the allegedly ‘man-made’ climate influence from the natural variations our wonderful planet delights in delivering to us. Now hoping she steered enough of her audience back ‘on message’ she concludes, “We need new holistic approaches enabling us to design adaptation to climate change. The federal government, based on their new energy research program to be adopted this spring, will consistently start research activities to max out industrial efficiency potentials as well as those in the fields of buildings and traffic and to open up renewable energy sources. Only this way will we achieve our ambitious climate protection goals and reduce global increase of temperature as much as possible.” So that hubristic ‘we must cut global temperatures by two degrees’ anthem hits the trashcan, too! To sum up, despite increasing evidence contradicting the claims of global warming the deranged governments in Europe, including pro-green Germany, still clinging to the forlorn hope that voters are going to allow the imposition of some climate-related taxes, only today, the spin is firmly on ‘climate disruption’ and ‘mitigation’ because no one, not even the pro-green Germans, are buying the discredited global warming spiel any more!